On March 16, 2011 the Holliswood School had a special guest speak with the students. 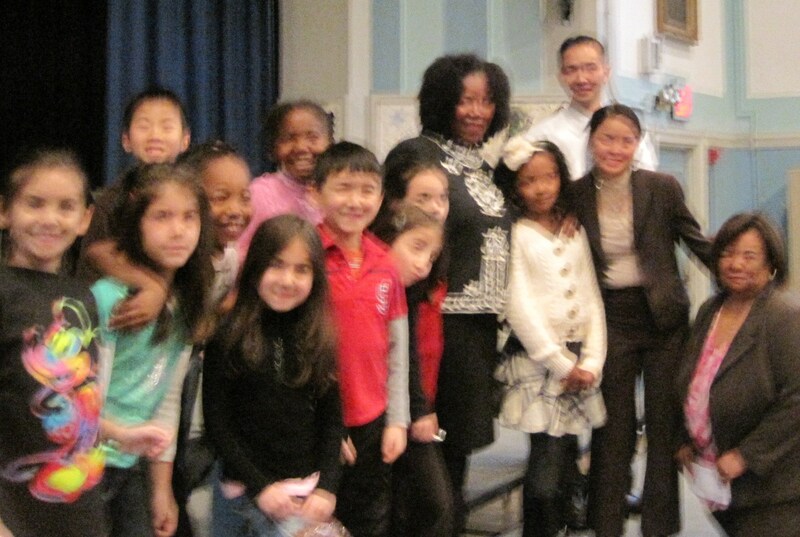 Civil rights hero Ruby Bridges came in from New Orleans to present her life story to the children. Students in grades two through five were present at this unique assembly in which Ms. Bridges asked critical thinking questions engaging the audience filled with students, teachers and administrators All of the classes prepared themselves by learning the story of her journey, and read the books she had written. Meeting Ms. Bridges was a personal dream of mine. Every year as I teach another group of children about Ms. Bridges, I have learned something more about her life, and my understanding has grown deeper. I always connect the history lessons learned in her story to our character education lessons. This year I decided to write a song in honor of Ms. Bridges and her teacher Ms. Henry. My students were able to express the emotions of what they were learning about Ruby by singing what she has meant to our country. I asked musician Louis Vignapiano who is a champion of the Kids for Coltrane Project in Education to write a tune for us. After studying her life, he was moved on a deep level and wrote a touching tune that resembled the sounds in a music box. He called it “A Child of Ours”. It was perfect for what we were feeling about Ruby and her teacher Ms. Henry. I proceeded to write the lyrics which were connected to the lessons I taught the children about little Ruby. In 1960, when Ruby was six years old her actions helped change the world. There was still segregation in some states in the country, and although the law had been changed through the case Brown v Board of Education there were still some people who did not want desegregation. With the help of the Supreme Court, President Kennedy, and determined American citizens, change did in fact occur. Ruby was one of the first African American students put into this position of change in her community. Her family had the incredible courage to send little Ruby into a situation which was very dangerous, but they knew change must happen for justice and liberty for all. For many months this little girl was escorted into the school building with armed United States marshals for her protection. Ms. Bridges told the audience a white mob would scream at her every day for a year. They even had a real child’s coffin with a doll in it, and one woman showed her a rope to represent hanging. It was very hard to hear. I could not hold back the tears as she presented the story. But it was also a story of amazing hope. Her Caucasian teacher Ms. Henry stood by her. She made learning fun, and loving each day, even though for many months Ruby was alone in the school building. Eventually the white children came back to school, and the mob went away. Some of the white families had wanted to send their children earlier but were threatened by the mob. Today the schools in this country are desegregated and offer children equal opportunities. Ms. Bridges told the children to give each other a chance. She connected her words to those of Dr. Martin Luther King Jr. who wanted people to judge one another by the content of their character. Ms. Bridges spoke for two hours and told her story in details that shone a light on the harshness of racism. And she brought us to a place of hope by example. One of my students Kennedy gave her a bouquet of flowers. Kennedy who is a Haitian American, told her dad if it wasn’t for Ruby her class which is made of many races couldn’t have been together. Her dad told me she picked out her outfit a month before so she could look just right for meeting such a special lady. We also gave her a CD of my students who are nicknamed “the Kids for Coltrane” singing “A Child of Ours”. Kids for Coltrane are… Kids for caring, curiosity, and creativity. It was wonderful to hear that Ms. Bridges and Ms. Henry are still great friends. They were brought back together on the Oprah Winfrey show after many years and remain very close. I want to thank my principal Mrs. Ambert for valuing my request to bring Mrs. Bridges to our school. With the support of the administration, parents, teachers and students this incredible learning experience was realized at the Holliswood School. We know that the children will always keep in mind Ruby’s words to give one another a chance. 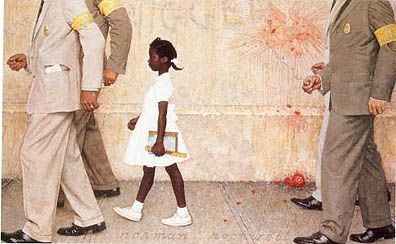 We are grateful to Ms. Ruby Bridges for making her way to our school to help our children learn a lesson that they will never forget. For more on Ruby go to my links section and click on her official page.